The Urban Family Center. Photo credit to Ayla Safran, ’15. New York City has record numbers of homeless people. According to the Coalition for the Homeless website, 58,056 people will sleep in New York City’s shelters tonight, the highest number on record. Of these people, almost half will be children in families. The number of homeless children in NYC has increased 63% in the past five years. Mayor Bill de Blasio has made significant efforts to lower these frighteningly high numbers—the average stay of a family in a shelter, for example, has decreased by one month since he took office—but New York City’s homelessness crisis is still very far from being resolved. Thanks to the Urban Family Center, however, 82 homeless families will rest comfortably tonight. 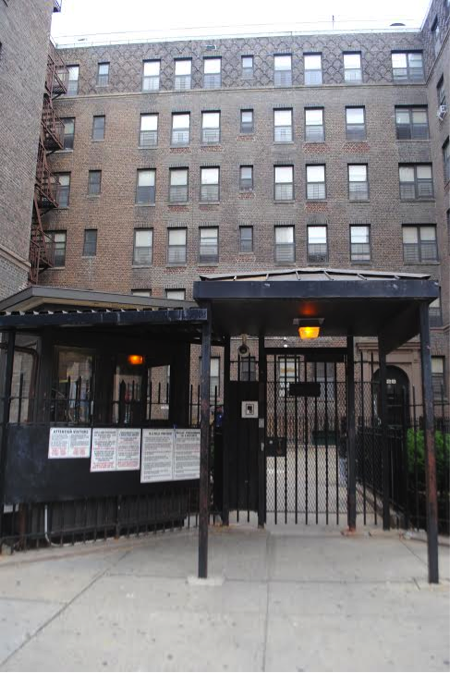 Located at 130 Baruch Place, around the corner from BHSEC, the Urban Family Center is America’s first-ever family homeless shelter and one of the city’s best. The shelter is located in the Lavanberg houses, a complex of six brick buildings built in 1927. It houses 82 families of two to ten people. Families live in furnished apartments with up to three bedrooms, each with a private bathroom, living room, and kitchen. These individual apartments ensure privacy and set Urban Family apart from other city shelters, where living and dining spaces are sometimes shared. Armstrong has been working at the Urban Family Center for 28 years, and she has seen the shelter rise to meet the challenges of the city’s rapidly increasing homeless population. When she started working at the Urban Family Center, New York City’s homeless population was ten thousand. In the past 28 years, that number has increased almost sixfold. Affordable housing is increasingly difficult to find, so families are spending a longer time in the shelter. Families stay for an average of sixteen months, slightly under the citywide average of 525 days. “Most of the families that live here—actually, most of the staff that live here—can barely afford to rent an apartment, certainly not in Manhattan or New York City,” says Armstrong. While twenty to thirty percent of the shelter’s residents are employed, they are not necessarily employed at a living wage. Thankfully, Urban Family provides its residents with a host of much-needed services to help them “reach for bigger and better,” according to Armstrong. An important component in helping the homeless break out of poverty is education. Less than half of the adults at Urban Family don’t have a high school diploma. A new workforce development program, called Task training, helps families improve their mathematics and English skills in preparation for a Task test. Residents of the shelter are also provided with employment assistance. The shelter’s staff has connections with privately funded community-based organizations that can help teach the homeless the skills they need for landing a job, such as resume writing. The support the shelter provides is social as well as financial. Urban Family employs a trained case manager who is on-call 24/7. “The crisis typically happens at two in the morning, not two in the afternoon,” Armstrong says, “and unless we have people who can deal with it at that time, it’ll just spill over.” Additionally, Urban Family employs five live-in staff members, which is unique for urban shelters. Urban Family also regularly hosts community events, parties for every holiday, and a plethora of activities to engage every age group, including drop-in childcare, computer access, after-school activities and summer day camp. “There’s lots of different things that families can get involved with if they choose to, which we think also helps it to feel a little less institutionalized, and a little bit more friendly,” says Armstrong. There are also opportunities for BHSEC students to get involved at the UFC. Students can intern in the front office and volunteer to tutor homeless kids. Last year, BHSEC teachers provided the shelter’s families with holiday gifts, Armstrong says. But the building has survived, and thrived, for 42 years. The Transitional and Supportive Housing program has expanded to include three other shelters and one supportive housing residence. 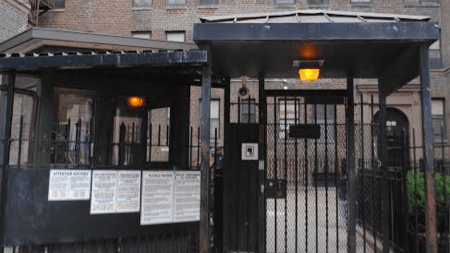 The Urban Family Center is part of a network of Lower East Side homeless shelters, all located within walking distance from one another and operated by Henry Street Settlement. The shelters provide temporary and long-term housing for the hundreds of homeless and low-income families, single adults, and mentally ill individuals who struggle to find affordable housing. East Third Street Supportive Residence, the newest of these shelters, contains 52 units open to homeless and low-income individuals, most of whom are diagnosed with mental illness. The Domestic Violence Survivor’s Shelter, established in 1977, is an emergency shelter that provides a safe haven for female survivors of domestic violence and their children. Like the Urban Family Center, the Domestic Violence Survivor’s Shelter provides counseling, housing assistance, employment assistance, and a host of other services to its residents. Helen’s House, a shelter on Henry Street that serves families of one adult and up to two children, and Third Street Women’s Mental Health Shelter, which houses 79 mentally ill women, are also included in the division. Henry Street Settlement’s core values have stayed constant over the years and are honored in every shelter in the division. “Everyone is to be treated with dignity and respect,” says Armstrong. The Urban Family Center’s commitment to respect is reflected in the attitudes and stories of the shelter’s former residents. Ninety percent of residents who exit the shelter move into permanent residences. “I don’t even want to think about where I’d be if it wasn’t for Henry Street Settlement,” says Theather Huggins, “and that’s the honest truth.” Huggins, a former resident of the Urban Family Center, now lives in permanent housing and is Henry Street’s Housing Specialist for Battered Women. Next BHSEC Young Dems Spread Safe Havens Through the L.E.S.